The different Barangay Health Workers and Sanitary Inspectors during the training. USAID-Philippine Sanitation Alliance (USAID-PSI), the City Government of Zamboanga and Western Mindanao State University held the Trainers’ Training for Sanitation Inspectors, Barangay Health Workers and community leaders last January 27 and 28 of this year. The event which is part of the Septage Management Promotion Campaign aims to educate the community by reaching out to the grassroots level. 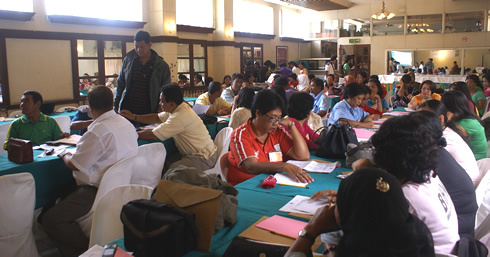 The said event was held at the Conference Hall of Zamboanga Seafood House. The 2-day training covers different talks on septage management, presentation of research outputs and workshop for community-based promotion. WMSU-College of Science and Mathematics spearheads in the promotion campaign in realizing the goals of the City Ordinance 2009-152, which seeks to establish a septic management system, in compliance with the national law on water waste management. The septage management aim is to address the perennial flooding and to prevent waterborne diseases outbreaks in the city. The event seeks to prepare and strengthen the skills of the would be advocates of this program. Barangay Health Workers, Sanitation Inspectors and the community leaders were trained on how to utilize the promotional materials and to make use of their skills in spreading awareness among their respective communities.